National Park ALTIN-Emel concentrated variety of landscapes-from sandy deserts to mountain ridges Sholak, Kalkan, Aktau. The purpose of the creation of the Park is to preserve the unique natural complex, archaeological and historical-cultural monuments, rare and endangered species of plants and animals, development of ecological tourism. 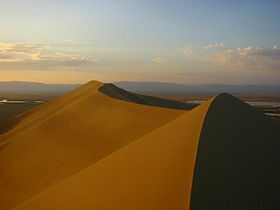 The most famous attractions of the Park is the "singing sand dune in length 1,5 km and a height up to 130 m; сlay mountains cut canyons – Aktau; Katautau – mount folded volcanic rocks. The system of three lakes in the Northern Tien-Shan, in the gorge Kolsay, in lintel, connecting ranges kungei-Alatau and Zailiysky Alatau. 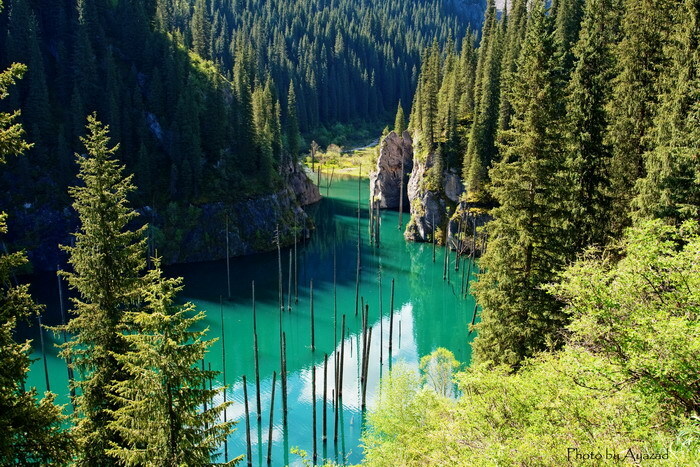 Kolsay Lakes is one of the most beautiful places of Kazakh land. They are located at heights 1800, 2250 and 2700 metres above sea level. They are distinguished by the unique mountain landscape of the watershed, consisting of three natural zones, and a variety of rare plants and animals. The Lake, located in Zailiysky Alatau at a height of 2511 m above sea level, in 15 km South from the center of Almaty. Mountains of Zailiysky Alatau are very picturesque Lakes. 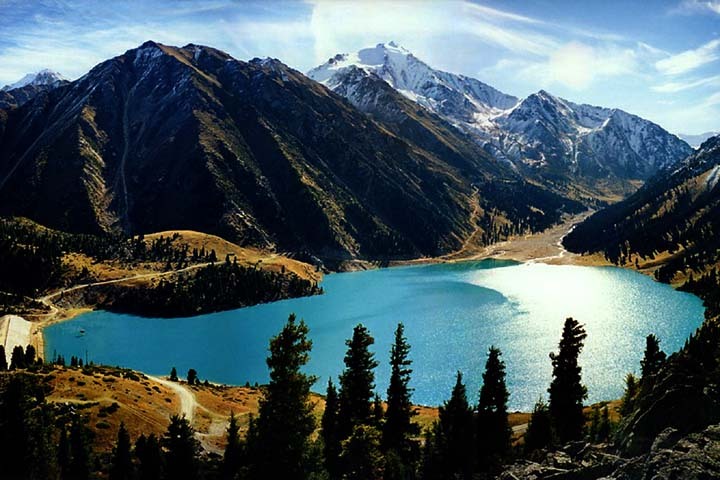 One of them – is a Big Almaty Lake. it is beautiful espexially in condition of good weather, especially early in the morning, when its blue surface mirrors in the sky and surrounding mountains. Lake Kajyndy, formed over a century ago in a landslide, located among which are covered with coniferous and deciduous forests Kungei-Alatau mountains, in 280 kilometres east from Almaty. Despite the low water temperature, kaindy Lake is popular with diving enthusiasts. The main attraction is Lake spruce, rising straight out of the water. The Lake is often referred to as “dead” – It does not fish. National Park is located within the absolute heights of 600 before 5000 m. above sea level. 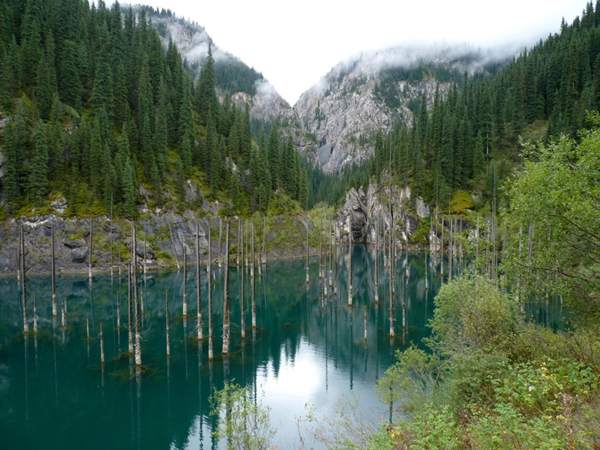 The basis of the nature park are the picturesque forests, built from spruce Shrenk and related species melkolistvennyh Apple Sievers, Hawthorn, Wild apricots, Tien Shan mountain ash and other woody and shrubby breeds. The history of this region has absorbed the legends and beliefs of paganism, Zoroastrianism, Buddhism, the traditions of Islam. This is where you can meet the Dark Tower of silence, the holy stone and mysterious Snow Lotus flower is a very rare, that will bring the person or perdition, or luck. Saki mounds. The Golden man. The most vivid manifestation of the Saka culture in Kazakhstan – archeological monuments-burial mounds. Among them are rare on issyksky mound-burial ground, located in Almaty region on the outskirts of esik, in 50 km from Almaty.. Saki mound, widely known throughout the world. Under it, in the grave, lined logs spruce, on the wooden floor lay the remains of Saka Warrior clothes, entirely covered with gold plates. Burkhan-Bulak Waterfall – is the highest waterfall in Central Asia is in Today district of Almaty region, Republic of Kazakhstan in the Dzungarian Alatau mountains in the Valley of the river above the city Bark Tekeli. Total height: four Cascades 168 m, and the visible part is the lower three stages — 114 m.
Charyn Park is located in the Centre of the Ili Intermountain hollows, in 193 km from. Almaty. It includes the canyon Valley and the River Delta, adjacent areas of deserts Charyn State national natural park was created to preserve the natural landscapes, with special ecological, historical and aesthetic value. Over the centuries, nature has created the beauty of the Canyon. 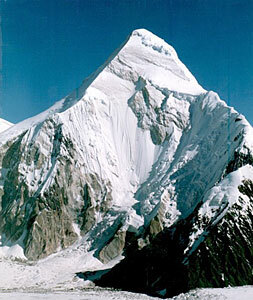 Khan-Tengri Peak – mountain peak, the highest point of the Republic of Kazakhstan on the border with Kyrgyzstan and China. Its height is -6995 m., other data inform about-7010 m. Khan Tengri is situated - in the eastern part of the Central Tien-Shan mountains on the Ridge Tengri-tag. The name of the mountain has some overwhelming, one of them – “bloody mountain”.